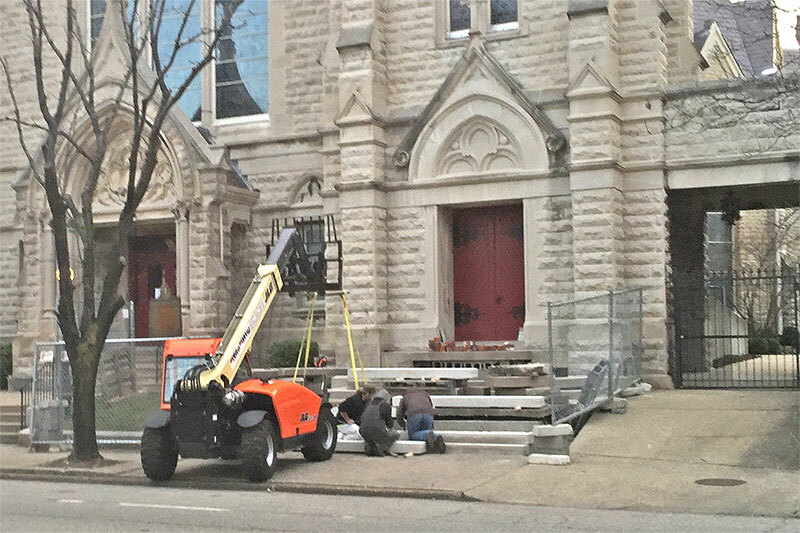 Located just around the corner of the 800 Tower City Apartments in SoBro, Calvary Episcopal Church, 821 South Fourth Street, is busy restoring the limestone steps leading to the monumental edifice dating back 140 years to 1876. According to Brad Fewell, a member of Calvary’s Property Committee, the Gothic Revival–style church‘s original limestone steps had substantially deteriorated, with cracking, settling, and shifting over the years. The church attempted to cement the steps back together, but in the end new limestone steps were chosen to complete the repair. Work has been going on for a while now, with Google Street View capturing construction work in December 2015. A tipster sent in the above photo of the new limestone steps being installed this week. Work is expected to wrap up within the next two weeks. Calvary Episcopal was built in two phases, by two architects. The first phase, designed by Louisville-based architect William H. Redin from 1872–1876, built the sanctuary and part of the nave. A decade later, a second phase from 1886–1888 by architect Henry P. McDonald of McDonald Brothers completed the nave and built its Fourth Street facade (from Redin’s original design). The structure was listed on the National Register of Historic Places on January 18, 1978. The main facade consists of a central gable pierced by a massive equilateral arch window, and two flanking towers of differing shapes and heights. These elements of the exterior announce the three-part division of the interior. A modest porte-cochere is attached to the square tower at the southwest corner where a spire achieves a height of 250 feet. The entrance occupies a centered position, and its arched portion is enveloped by a rather plain accolade, as is the entrance to the square tower. Inside, the church’s sanctuary soars to 70 feet with ornate timberwork holding up the ceiling. National Register documents say the design is similar to the medieval Westminster Hall in London. The church boasts three stained glass windows designed by the studio of L.C. Tiffany. Calvary Episcopal is generally regarded as one of the best preserved churches in the city. If you’d like to submit a tip, simply click Submit a Tip up top or email us at tips@brokensidewalk.com.